Dozens of Israeli soldiers invaded, on Thursday morning, Jenin refugee camp, in the northern West Bank city of Jenin, injured four young men, and caused many to suffer the effects of teargas inhalation, in addition to abducting one Palestinian. 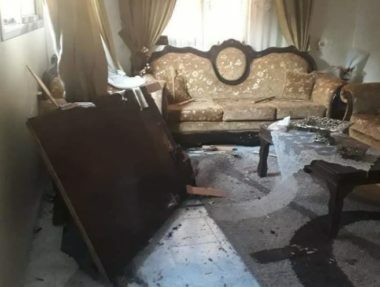 The soldiers stormed and ransacked dozens of homes in the refugee camp, and interrogated many Palestinians before abducting Mohammad Suleiman Sa’adi, in his twenties. Many Palestinians protested the invasion, and hurled stones at the armored military vehicles, while the soldiers fired live rounds, concussion grenades and gas bombs. Medical sources said two young men, identified as Mohammad Ahmad al-Hosary and Ahmad Mohammad Abu al-Haija, were shot with live rounds in their legs, and added that two Palestinians were injured by shrapnel from concussion grenades, and many others suffered the effects of teargas inhalation. In related news, the soldiers invaded Toura village, southwest of Jenin, and fired many gas bombs and concussion grenades at local protesters.